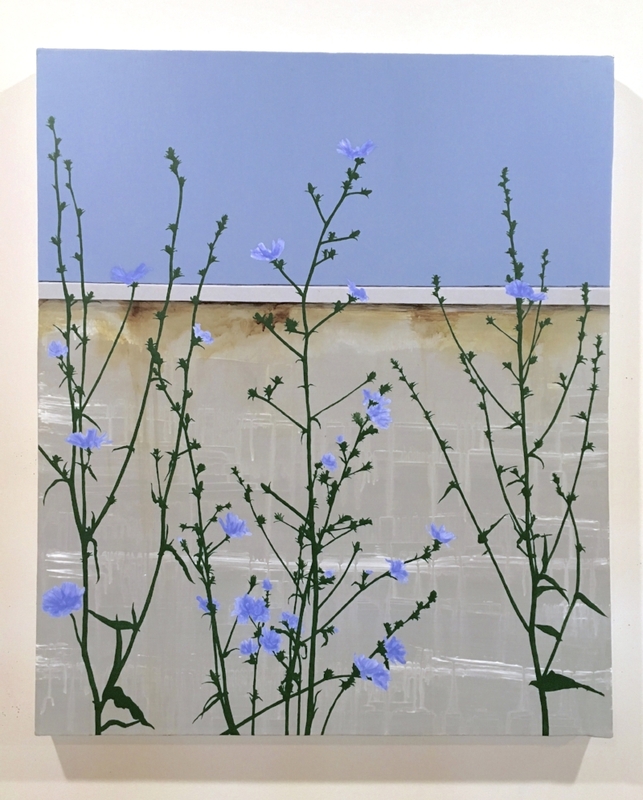 Chicory, acrylic on canvas, 2016 by Hannah Cole. Courtesy of Slag Gallery, New York. I see all kinds of incomes in my tax practice, and the one thing it confirms for me is that, once past the basic human needs, money and happiness aren't related. I've been doing a lot of reading on the science of happiness lately, and also on the financial independence movement, (favorites: Mr. Money Moustache, Frugalwoods, and the Mad Fientist) and I've suddenly been noticing the strong thread of happiness science within the extreme-frugality movement. And I had a thunderstrike: artists have a superpower. We already know this. No one goes into art because their top priority is getting rich. And most artists do go into it because they feel a need, and they get things out of art that are more important than money. Things like connections, community, curiosity, continuous learning, challenges and projects, and engagement with the unknown. So this post is just a word of appreciation. We freelancers pay a lot of tax. We don’t just pay an income tax rate of anywhere from 0 to 39% on our freelance income – we also pay a flat 15.3% self-employment tax, no matter what our income bracket. Without tax planning, this can be a huge bite. You’re having drinks with a friend after an opening, and the topic turns to money. Life is expensive, the city is expensive, and the distant menace of retirement? Forget it. You turn back to your $14 cocktail and feel depressed. But wait. Aren’t you the same person who is taking charge of her career? Aren’t you setting new goals, prioritizing your studio time, building your network, learning how to market yourself? You’re smart, and you’re tackling the other hard stuff. So why are you cheating yourself on the bigger picture? You can do this. No need to let the perfect be the enemy of the good here. There is an apt proverb about planting trees: The best time to plant a tree was twenty years ago. The second-best time is now. But first, a little digression about beauty. And compound interest. Sara Jones, drawing on paper, 2016. This is a drawing by Sara Jones. Beautiful, right? It has a lovely feeling of calm about it. Remember this feeling as you read on about saving. I think saving for the long term can be intimidating, because it seems that we’ll need so much money that we just get overwhelmed. It’s easy to focus on the short term (My rent is so high! Childcare costs are ridiculous! How can I really cut any of my spending? How is $100 a week going to make a dent?). It’s easy to think “I’ll do that later, when I have more money.” But the difference between starting now or ten years from now is bigger than you think. Now look back at Sara’s drawing. See the curve? That’s the image that should be in your mind as you think about saving. That’s what happens to your money. Why? Because of your friend, Compound Interest. This is a chart showing what compound interest does to a one-time $5,000 initial investment. Don’t let the details throw you - the curve is the important part. The light orange part shows the money you put in. The dark orange part is all growth. When you put money in a savings vehicle (like an Individual Retirement Account (IRA), invested in index funds, which have a historic average growth rate of 8% - more on this in a future post), compound interest works to multiply your initial investment over time. Here’s how it works: Your 5,000 earns 8% interest, so at the end of year 1, you have $5,400. The next year, you make 8% not on 5,000, but on $5,400, yielding $5,842. It doesn’t seem like much yet, but the magic happens near the end. So this little bit of money, after 40 years of compounding, turns into $108,622.61. Now we’re talking. It’s important to notice the numbers here. The chart reaches into the millions now, not hundreds of thousands. And the light orange part, which represents money you put in, is growing each year, as you make your annual contribution. So in forty years, you now have $1,507,527.81. Compound interest is your friend. It means you don’t need to save as much as you might fear you do in order to retire. And as a tax professional, I will tell you that your annual contribution limit to a tax-sheltered IRA is even a little higher than in my example. The 2015 limit is $5,500. And you have until April 15 to contribute for 2015 (yes, it’s retroactive). Opening one is as easy as opening a bank account. I recommend Fidelity or Vanguard. So don’t let perfection stand in the way of action. Maybe you can’t put aside as much as you’d like, but you can put aside something. But don’t wait for some elusive “better time.” Remember the proverb about the trees? The best time to save was twenty years ago. But the second best time is now. Disclaimer: True tax advice is a two-way conversation, and your accountant needs to hear your full situation to apply the rules correctly in your case. This post is meant for general information only. Please don’t act on this alone.